It was a gigantic and unequal struggle what the citizens of Bronte embarked upon to get back the possessions and the rights of which had been deprived once, in 1491, by the disastrous donation of the Maniace Abbey and their territory, that Pope Innocenzo VIII had made in favour of the Big and New Hospital, being built in Palermo, and, after three centuries, in 1799, by the regal gift that Ferdinando I had made to Horatio Nelson. It was an interminable and unbroken judicial fight that lasted well four centuries and literally ruined the already poor Bronte’s community. 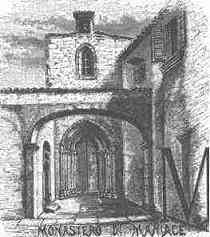 Since the first donation, (made by the Pope), Bronte had seen his territory, then expan­ded for the emigration of the Maniace’s people, getting smaller from day to day, till disappearing nearly altogether, for the new usurpations, rights, quibbles and unjust claims, first by the Palermo Hospital and afterward, by the new owner, the Duke. The ecclesiastic tithes, due originally to the Messina archbishop, and then to Maniace’s Abbey, were transformed in fees, and were confiscated also the taxes (the "gabelle") that the poor Council used to draw. Continuous were the denunciations against the citizens and violent the criminal trials brought forward by the new owners. The best and most influential citizens of Bronte, from 1512 to 1778, were proces­sed, jailed, tortured and forced to exile. The historian Benedetto Radice, in his “Memorie storiche di Bronte” dedicates many pages to the court case that he defines: “The big dispute”. Many wealthy families were reduced to misery by oppressive disputes, others forced to emigrate “with pain” writes the Radice, “some citizens, having lost any feeling or love for their native land, became, for sordid interests, partisans and defender of the foreigner". And goes on writing that “during the centuries XVII and XVIII, while the fervent dispute against the Big and New Hospital of Palermo was going on, for the disastrous donation of Pope Innocenzo VIII, all of Bronte’s people, priests, lawyers, citizens improvised them­selves as historians, as the dispute was actually around an historical question: that is, if Bronte had existed before the Maniace’ monastery, or if had been the Abbey’s colony and dependence”. Brontesque Steropesque et nudus memba Piracmon”. “Lacking unity in the laws and in the administration, often happened that a magistrate undid what another one had done; the right was never certain and sure, being diverse and changeable the judgment of men. “The stronger often has the upper hand over the weak. It is the story of human events. The pious rectors, on the pretest of charity, obtained from the Courts whatever they wanted. Bronte’s people, deprived of their rights, were considered exploiters of poor ill persons. Some jurymen, accepting the Hospital reasons, betrayed their country town and helped the Hospital to impoverish further Bronte". Writes that “…among the many miseries, in support of who cultivates noble and patriotic sentiments, is worth of memory the name of the jurist and notary Antonino Cairone , strenuous and heroic defender of the Council rights” and “feeling posthumous gratitude” talks extensively of this scholar and expert of rights, that he defines “unbeatable fighter” with profound knowledge of judicial discipline. This is what Benedetto Radice reminds us of: “In this gigantic fight against the Hospital, in the XVII century, the humble jurist Antonino Cairone was the soul and the mind. Fifty years of tireless work and large expenses at the service of the Council, exhausted his rich patrimony but didn’t wear out his fibre of invincible fighter, as was called by the Fiscal lawyer of the Real Patrimony. Even the coat of arms of our Council reminds us of this heroic Bronte’s citizen of the 1700. There are two images of our Council coat of arms: a blazoned one, not in any way connected with Bronte’ history, that doesn’t have noble origins. Many defensive memories and writings of the jurist Antonino Cairone are preserved in the Nelson Du­chy archive. In fact, whatever was regarding Bron­te in the ge­neral repertory of the big and New Hospital of Palermo, (from page 607 to 621), was con­signed to the Duchess of Bronte, Charlot­te Nel­son Brid­port, grandchild of Horace Nelson, with an act da­ted 4th and 9th of March 1857 drawn by the no­tary Francesco Anelli of Paler­mo. Among the documents, writes Benedetto Radice, there are the acts, (from 1512 to 1778), of court cases against citizens of Bronte and the Volume n° 66 that contains ”Council reports and notes by Antonino Cairone for the court case related to “mere and mixed rule”. “All the volumes regarding Bronte are 131 and 46 those regarding Maniace. Many news, that could throw new light on the reported facts are contai­ned in these volumes that the Duke didn’t allow me to read”. Antonino Cairone, in the year of his death in 1756 wrote also some memories of his drama­tic vicissi­tudes. “The documents - conti­nues Be­ne­detto Ra­dice - are in Naples archive, in the Pa­ler­mo one instead there are only notes”. Elected irrevocable legal representative in1734, was provided with the necessary means to live and fight by every class of citizens: noblemen, peasants, middle class, and priests. «The pious rectors understood that in order to win they should get rid of the Cai­rone, and describing him as a turbid and uneasy element, and, with the complicity of some jurymen, succeeded in getting him dismissed from his office of notary and banished from his town. He suffered jail and exile from 1751 to1754. From Messina, where he stayed during his exile, always unrepentant, he was often asking for his return in order to defend his town from the rectors’ aggressions, while was sending to the King continuous memorials that, if were showing the uneasiness of his spirit, were also showing his obstinate love for his town and revealed the flaws of the rectors. Once they, with the help of the military, took away, with violence, the papers of the dispute that he had left in custody to his brother in law, father Tommaso Schiros, very erudite man in his time, and superior of PP. Minoriti in Acireale’s convent. In 1745, at 79 years of age, was, for the twelfth time in Naples, imploring justice to the King in favour of his beloved country town». Was the Cairone a hero, wrote in a memory of 1717 the lawyer Giuseppe Sanfilippo, who wanted to imitate his example. Through Cairone’s work Bronte obtained favourable sentences and advantageous transactions. What Bronte owns is due mainly to this hero. «With unequalled courage he lashed out against the pious rectors’ pity, who, on the borrowed sums were charging the Council 9 per cent interest, that the same rectors did not pay to the Paganetto. It was a scrounging, to the point that the King’s Court, discovering the flaw, declared extinct the debt». «The pious rectors, hoping in time, for twenty years, with quibbles and acquiescence of magistrates, dragged on the endless discussion of the dispute, renewed in1735. Cairone openly accused the jurymen, sold to the Hospital, to procrastinate the judgement and was asking for the removal of magistrates and Fiscal lawyers of the King’s Patrimony, that, in league with the pious rectors, were not acting in the interest of Bronte or the Fisk». The Radice continues writing that «… having lost faith in the magistrates, he was addressing the sovereign and to the sovereign, with citizen’s pride, was asking also to confer to Bronte the title of State city. «Various were the humours of the people of Bronte in the enormous struggle. The ancient discord spirit had woken up. The majority was for the court case, and the Cairone participated to its cost. Others, fearful and slaves at heart, did not want any more sacrifices and accused, to the government, the pertinacity of the Cairone, describing him as a turbid citizen. The same accusations were made to him by the Tanucci. Antonino Cairone lived only for the court case. In the struggle he was carried away by his patriot’ ideal. For all his efforts, he was paid with the slander by his contemporaries and the ungrateful posterity’s oblivion. It is the usual money with which benefactors are paid. Few years before, another great son of Bronte, Ignazio Capizzi, started the construction of his College, the Cairone died in poverty, obstinate in the sin of love for his town, the 26th of November 1758, falling off a horse. His friends gave him a funeral and a free burial in the Annunciate’s church. After he had gone, the baron Silvestro Politi was elected new legal representative for Bronte’s state property and the return to the King of two Abbeys”». It seemed done, but very soon everybody realized that all the struggle and sacrifices had been useless. Everything was going back as before. New events, in fact, followed few years later. As a prize for having smothered the Neapolitan Republic, and having put him back on the throne, in 1799 Ferdinando I gave again the city, the land and the peasants ( "i villani") to a new owner: the Admiral Orazio Nelson. And to express fully his gratitude, the gift was made “in the same manner in which had been made to the Big and New Hospital of Palermo.” "The loathed Ferdinand I", (so used to call him Benedetto Radice), thwarting the sacrifices and the struggles of many generations, in front of law courts, did not take in any account the release from feudal power from the Hospital or the acquisition of the “mere and mixed rule”. So the dream for its freedom ended, and Bronte, fell again in the vassalage from which was hoping to exit. The court case continued against the Duchy and the heirs of the admiral (the Nelson-Bridgeport); but continued also the hunger for land, and those social tensions that eventually led to riots and the sadly famous Facts of Bronte, became more embittered. In fact, during the agitations of 1820, the riots of 1848 and 1849 and above all during the 1860’s revolution (the Facts), the principal objective of the Bronte’s revolutionaries was always the immense land patrimony of the Nelson Duchy. «The court case - continues the Radice - flared up again with the new owner. Had more defeats than victories, but in 1861, after the unitary revolution, was cut off by the energy and patriotism of the doctor Antonino Cimbali, that as Delegate of Public Safety was very popular and highly respected». As the time went by, the figure of the jurist An­tonino Cairone, an illustrious citizen of Bronte of the 1700, that, as written by Benedetto Ra­di­ce, “suffered jail, exile and poverty” defen­ding the interest of his Council, appears as just vanished and faded away from memory. Besides Radice, nobody has dedicated a page to him, or a tablet, or a simple commemo­ration. His town did never demonstrate much gratitude to him, not even entitling a street to his name. P robably nobody wants to remember the usurpa­tions, the struggles and the sacrifices of four hundred long years, or, maybe, the impossibility of access to the Nelson Historic Archive, (lasted up to 1981), has discouraged researchers and historians. We hope that the conclusion of the administra­tive procedure, started between the Council and the State of Palermo’s Archi­ve and the section of Catania, in order to bring inside the Nelson Castle a reproduction of the Nelson’s Historic Ar­chive, could finally induce scholars and resear­chers to revalue and make better known the tireless work and the image of this great coun­tryman of ours. On the right and on the left two images (of the 1880 and today) of the Maniace Ab­bey interior with the cloister and S. Maria’s church. 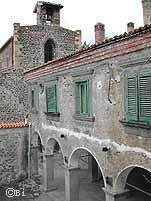 As believed by many, the ancient Abbey, which had beco­me in 1799 the noble residence of Nelson and his heirs, was for centuries the deep wound on the back of Bronte’s people who had to withstand also the ravaging eruptions of Mount Etna. Today the complex called “Nelson’s Castle” is the feather in the cap of Bronte’s historic- monumental patrimony.